It is taking me awhile to process the experience of crossing the finish line at the Boston Marathon at 2:39:20 p.m. – 10 minutes before the explosions went off at 2:49:43 p.m. Runners are greeted at the finish line by officials whose job is to make sure they move along quickly through the post-finish line area which spreads over three city blocks. This process includes; recovery drinks and water, getting a heat sheet blanket, a sticker to keep the heat blanket secured, a medal, the option of a photo while wearing the heat sheet blanket and medal and then a bag of food. I did all of the above, except for the drinks in those ten minutes. Just after receiving my bag of food explosions were heard and a very large plume of smoke rose to what seemed like 20 stories high. It appeared to be at least a mile away. My sense is that we were all thinking “this can’t be good” but were hoping that it might be simply be a gas explosion. Nobody wanted to believe that it could be something more sinister. 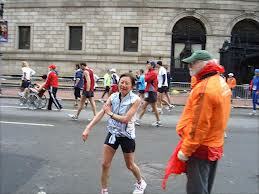 An integral aspect of the Boston Marathon experience is the spectators. Having been buoyed by their support all the way, I now realize survivor guilt is inevitable. The rational question is “Why anyone?” but as a benefactor of the incredible enthusiasm and cheer-leading at Boston the question for a participant becomes “Why so many spectators when they were only there for us?”. Somehow the mayhem did not immediately spread two blocks past the finish line. We did not hear a chorus of sirens wail, leading one woman to echo our hopes (or state of denial) when she said, “It’s funny that there aren’t more sirens maybe that means its not serious.” We saw one or two officials run towards the finish line but without giving us any direction. We had no idea what was going on. The roar of the crowds at Boston are deafening. I think I will always ask myself why we were not able to make out that the screams of encouragement from two blocks away had turned to screams of anguish, pain and terror. We finishers continued, albeit with some anxiety, with the usual post-race routine, the next step to pick up a checked bag. My checked bag contained items that I was willing to leave behind should the line-up be overlong. I have a cache of old gear saved expressly for this. 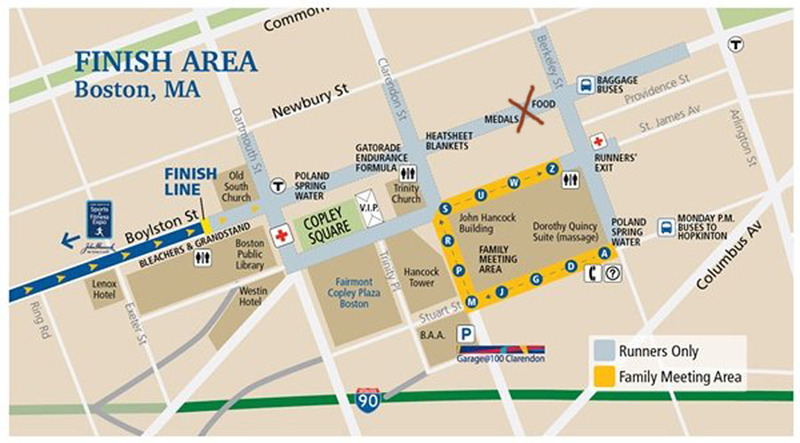 My habit with out-of-town marathons is to stay at hotel within reasonable walking distance to the marathon finish should I decide to skip picking up my baggage and have just a heat blanket to keep warm. I still considered picking up my bag as there was still no sense of panic in my immediate area. I walked by the baggage bus and saw that there was a line-up of 6-7 runners for my bib number sequence (which by usual standards is quite reasonable) but decided that it was sensible to skip the baggage check. I walked quickly out of the runner-only area eager to reunite with my husband asap. Our hotel was 1 mile from the finish line and our meet-up plan was a street corner enroute to the hotel. The understanding was that if he was not there, I would likely head back to the hotel and message him. At the best of times, nothing is more unpredictable than trying to connect with friends and family after a marathon, especially when you are away from your home city. The chaos and worry that ensued for all those who were more immediately affected by uncertainty in reuniting must have been grueling. My mental construct was that my husband may have seen me cross the finish line and be walking parallel to me on the sidewalk toward the exit to the runner-only area or our meeting spot. I drew this image from 2007 when I was spotted by a friend just after I finished and she took a photo from the sidelines. Since I did not realize how close the blast had been this image did not cause me to worry. I walked over to our meeting spot and my husband was not there so I walked quickly back to the hotel where I immediately emailed him. Shortly after, he replied . . .
After this an email arrived which included a link to a photo from the devastation at the finish line. I was then that I became aware of what had happened. Categories: Boston Marathon, Marathon | Tags: Boston Marathon, Boston Marathon 2013, Lynn Deutscher Kobayashi, Lynn Kobayashi, Running | Permalink. Thanks Kerry! I had hoped to be faster but I am thankful that I was “fast enough”.